Easily transition your look from a daytime event to date night with the must-rent Mimosa Pant by Lover. The navy pant features a fitted waistband and a flattering wide-leg silhouette that will make your legs look like a mile long! The flowy material ensures maximum comfort for day-long wear. For an effortlessly cool daytime look, pair the pants with a plain white tee and gold hoop earrings. When it’s time for date night, swap the tee for a silk camisole and hire a red mesh clutch to hold your evening essentials. Check out our blog for tips on how to transform your day look for a night out. 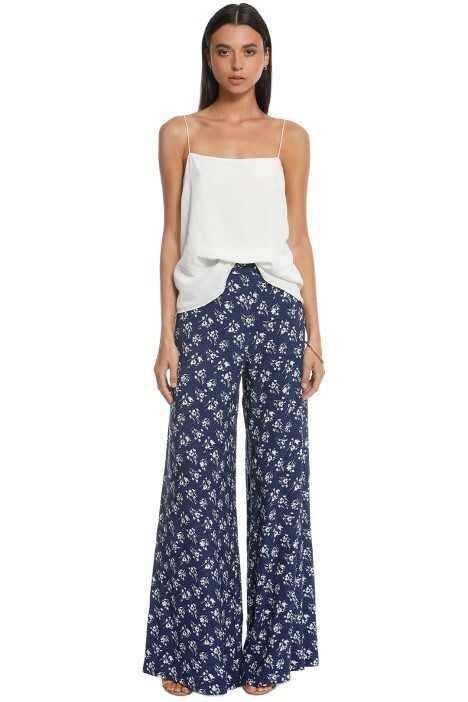 Pair this fun pants with simple sleeveless top or try Lucca Cami by Elka Collective. LENGTH: This pants is ankle-length. Mimosa Pant is rated 5.0 out of 5 by 1. Rated 5 out of 5 by Kate from Gorgeous for day or night event Absolutely stunning pants. I wore them for a day time event and received many compliments. I am tall and need a longer length to elongate the leg. Could be worn with both flats or wedges. Luxurious feel and beatiful finish.